"We love what you are doing and appreciated being a part of it this summer. Thank you to everyone for all your hard work to bring us good food!" "I'm really happy that my family and I are members. I love being able to support native owned agriculture." "Loved it. Thanks to all — you are all doing good and important work!" "It was fun to get some of the processed foods like the sun-dried tomatoes, stewed tomatoes, and herb-infused oil. This got me excited about processing some of the things I grow at home." "Having access to fresh produce is extremely important on the path to leading a healthy lifestyle. It’s also given us the opportunity to try a larger variety of vegetables that we might not otherwise buy on our own." Thank you for your interest in DWH's Indigenous Food Share (IFS) CSA. Please check back around February 2019 to sign up for this summer. If you have any questions, please email IFS@dreamofwildhealth.org. If you're eligible for the presale, you can register now. We strive to make healthy food accessible to all, regardless of income. If payment is a burden to you, please contact Staff for more information on payment plans, discounts, or using EBT/SNAP for your payment. What is an Indigenous Food Share? The Indigenous Food Share uses the community supported agriculture (CSA) model. This model seeks to put the ownership of our food system back in the hands of the community. Members invest up-front in the farm and receive a share of the farm’s produce. Each week (or bi-weekly for a half share), boxes are delivered to members at a drop site. All our produce is grown above and beyond what is required in certified organic produce standards. We choose to remain un-certified so that our food may be accessible to all in our community while still investing in education around healthy foods. We seek to be a part of restoring the health of our soils and health in our community by rebuilding our connection to indigenous foods. 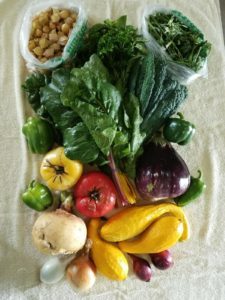 By signing up for our Indigenous Food Share (IFS), you receive a weekly/biweekly share of healthy, flavorful, freshly harvested produce from our farm for the season. Your purchase is also an investment in our sustainable farming practices that ensure future generations will have access to healthy food and healthy lives. Each box will typically include 10-15 varieties of vegetables, herbs, and fruit, based on what is in season. The produce follows the seasons and may also include our indigenous dried beans, wild rice, and other indigenous gathered or produced foods. Indigenous Ingredients –We incorporate as many indigenous and wild gathered foods as we can when available. Minneapolis at the Minneapolis American Indian Center 1530 E Franklin Ave, Tuesdays from 3 to 7 p.m.
Members are responsible for picking up their box every week, or to make arrangements for a friend to pick it up. We will not hold shares or reimburse for missed shares. Unclaimed boxes will be donated to food shelves (Tues) or co-op staff per Mississippi Market rules (Thurs). Contact us as soon as possible if you will be missing a pick-up date. Our Minneapolis location has moved to the Minneapolis American Indian Center. How is the IFS unique from other CSA shares? Our IFS is focused on representing indigenous foods to the best of our ability. In order to be a part of our food share, each crop must have value to the indigenous community in heritage or health. We include unique ingredients like ground cherries, wild harvested foods when available, berries, indigenous salad mixes such as amaranth greens and lambs quarters, wild rice, and indigenous squash varieties. By becoming an IFS member, you become a part of fulfilling Dream of Wild Health’s mission of increasing access to healthy, indigenous food in the Twin Cities. It is our goal to empower the Native community by strengthening families and communities around good food, healthy choices and restoring a relationship with the land. Members are encouraged to come out to the farm for events and harvest days! Is it Expensive? How Can I Pay? For 2019, the full share is $525 and a half share is $270. Many past members have had plenty to share with relatives, freeze or can for the winter, or split between families. We strive to make healthy food accessible to all, regardless of income. We prefer to have all the payments up front, but can be flexible. We accept cash, checks, credit or debit cards, and EBT. You can pay by mail, in person, or online. Shares will not be reserved until first payment is received.  If cost is a burden to you and you are interested in purchasing a share or if you would like more information on the payment options available to you, please contact us at IFS@dreamofwildhealth.org OR call 612-874-4200 (ext 113). Paying with EBT/SNAP - We accept EBT/SNAP as payment. Please contact Maddie to arrange monthly or bi-weekly payment plans. Would you like to contribute to allow a family to receive a discount on their share? Food access is central to our mission. In order to make the IFS more accessible, we offer discounts and payment plans to families who would otherwise not be able to afford a share. Your donations make that possible. To donate to our Sponsor-a-Share program, visit our donate page and when you are checking out, please specify that you are donating to the IFS program.